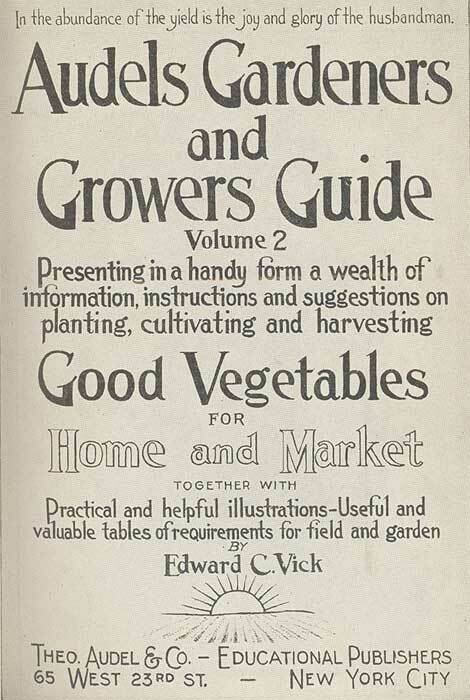 This incredible piece on storing vegetables came from Audels Gardeners and Growers Guide Volume 2, which was copyrighted in 1928. 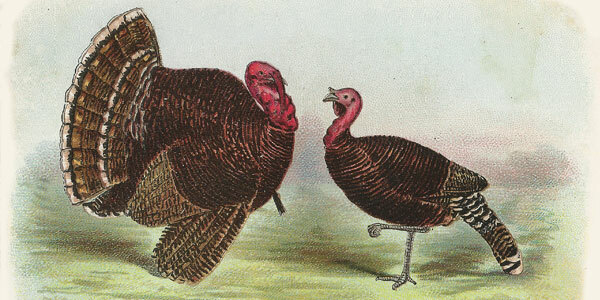 We are fortunate enough to have it in our collection of antique agricultural volumes. Potatoes may be safely stored in bits on a well drained spot. Spread a layer of straw for the floor. Pile the potatoes in a long, rather than a round pile. Cover the pile with straw or hay a foot deep. 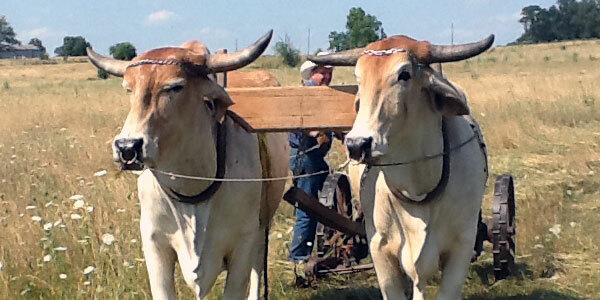 Cover lightly with earth, pulling a handful of straw up through the soil about every 10 or 12 feet. As the weather grows colder, add more earth to a depth of about six inches or more. As the weather grows still colder, another layer of straw is added covered with an 8 inch layer of earth, with a handful of straw pulled through here and there. 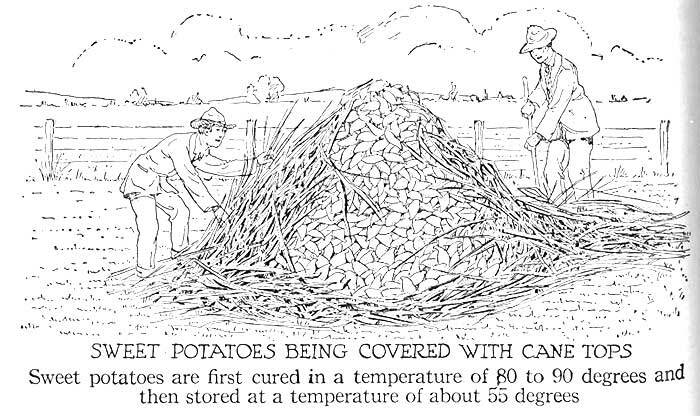 This will keep potatoes safely when the temperature drips to 10 degrees below zero. In colder sections still another layer of straw and earth will be necessary. Firm the earth on the pile, with the back of a shovel to make is as nearly waterproof as possible. 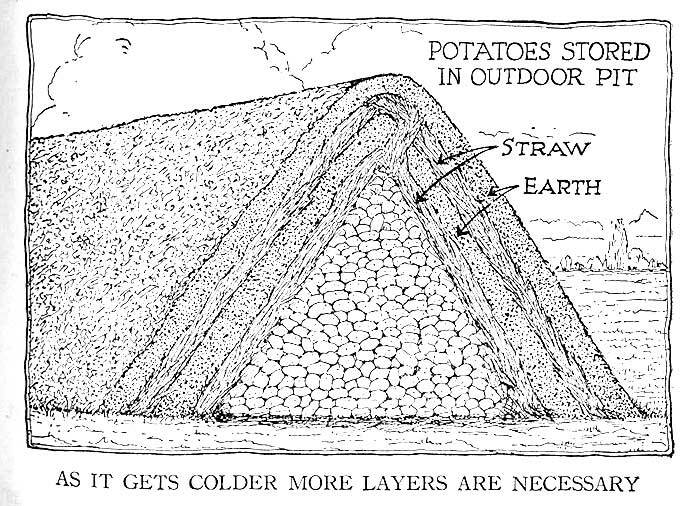 Potatoes keep better when stored in this manner. When stored inside, potatoes may be put in bins, barrels, boxes or bags, but must be protected from light. Beets may be stored in the same manner as potatoes. 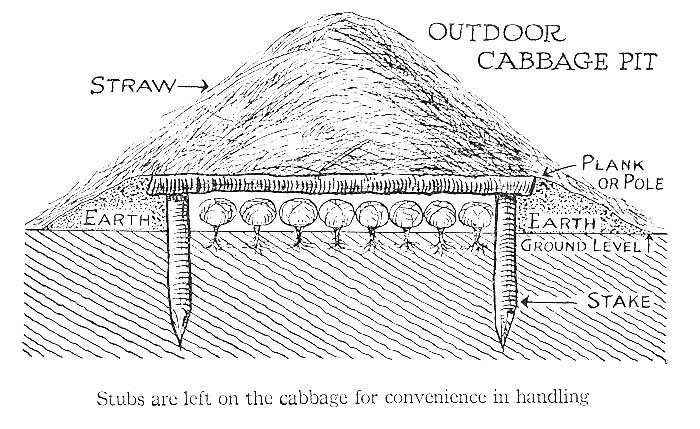 Cabbages can be stored in the same manner as for beets, but it is best not to pile cabbages one on another. Celery can be dug and stored closely compacted in trenches in the earth, made in a well drained place. 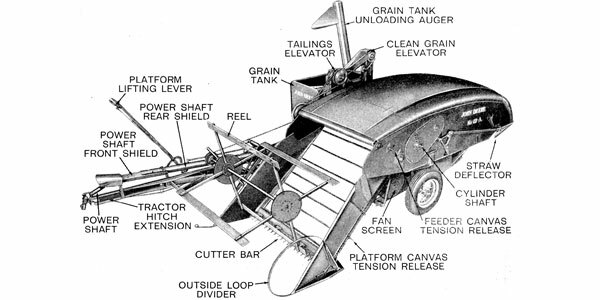 Cover the trenches with short boards laid across the trenches and cover the boards with earth. A board at the end of the trench is banked over with earth, which is removed to get at the celery as wanted. Carrots may be stored in outdoor pits the same as beets or in a basement. 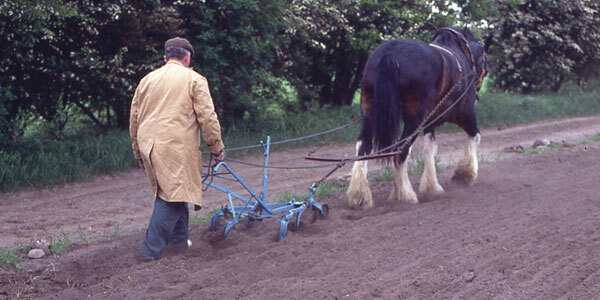 They are not injured by slight freezing and therefore do not require as much protection as potatoes. Onions must be mature and thoroughly dry to keep well. Place them in crates or loosely woven bags, as good ventilation is essential. A slight freezing will not injure onions if they are not handled while frozen. Onions may be stored in a well ventilated attic if such a place is available. Parsnips are not injured by freezing, but it may be difficult to dig them where the ground is frozen. Parsnips may be stored the same as beets or carrots. Pumpkins and Squashes should be stored in a dry, well ventilated place, above ground, if possible. Place them in rows on shelves so that they will not touch each other. Keep at about 50 to 60 degrees. Salsify may be stored the same as beets, carrots, and parsnips. Turnips will stand a hard frost but alternate freezing and thawing injures them. 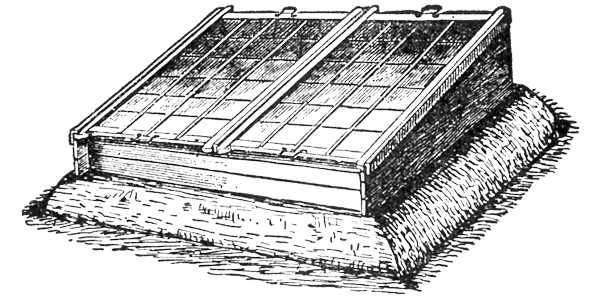 Gather, top, and store the roots in pits or storage cellar. In the cellar of a dwelling they give off odors that penetrate the house. Apples will keep well under conditions suitable for potatoes. Sweet Potatoes should be mature when dug and left exposed for a few hours to dry off. Handle carefully. They may be stored in pits. When stored inside they should be cured in good ventilation for two or three weeks at a temperature of 80 to 90 degrees F. After curing gradually reduce the temperature to 55 and keep it at that point as long as the potatoes are stored. In this manner they may be kept until spring.